Girls 13U Smash Epic Silver Medal Win at Provincials! April 29, 2013 13U Girls Epic Silver Medal Win at Provincials! After a fantastic weekend together at the 14U Provincials the week before, 13U Smash arrived in Waterloo ready to play their very best ever in the 13U Provincials Apr 27th & 28th. 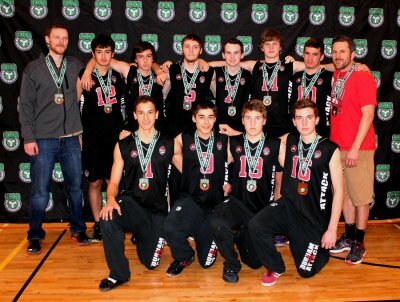 Smash entered Provincials strongly ranked in 7th, placed in Division 1 Tier 1. The team fought three close games on Saturday, finishing the day victoriously with three straight wins, against Storm Blizzard U12 (21-25, 25-22, 15-7) (a very strong team for U12, who ended up winning Gold in Tier 2), then against Etobicoke Titans 12U Atlas (25-12, 25-12), and Markham Stingers 13U (26-24, 25-23). Sunday morning brought a strong victory against Etobicoke Titans 13U Oceanus (25-23, 25-15), and then a hard-fought, awesome win in the quarter-finals vs. MVC 13 Black, who was ranked #1 going into Provincials (25-23, 22-25, 15-6). And then… in the semi-finals, Smash found themselves facing their nemesis STVC Tektonics (who robbed them narrowly of 3 Gold medals during the tournament season). Coming off the rush of a triumphant win the game immediately before, Smash showed Tektonics power like they’d never seen from Smash before, and after an epic battle …Smash emerged victorious (25-16, 18-25, 15-12), putting them into the Gold medal match!!! No win ever felt so good!! The Gold medal match was against Aurora’s very strong Storm Typhoon who was ranked #2 going into the Provincials. Smash conceded the first match 18-25, but did not get discouraged and maintained their intense effort, fighting their way point by point through the 2nd game, almost getting a chance to take it to a third game and a shot at the Gold Medal, but lost in the second by just a hair (24-26). A tough loss, but quickly forgotten in the thrill of winning the Silver Medal!!! An experience of a lifetime – what a way to top off an incredible season that none of the girls want to see come to an end. Big thanks to Coach Joel Banbury and Assistant Coaches Kristy Moore and Brook Luchka for leading the team to such tremendous success and making it such a happy and fun journey along the way! Way to go SMASH!!! 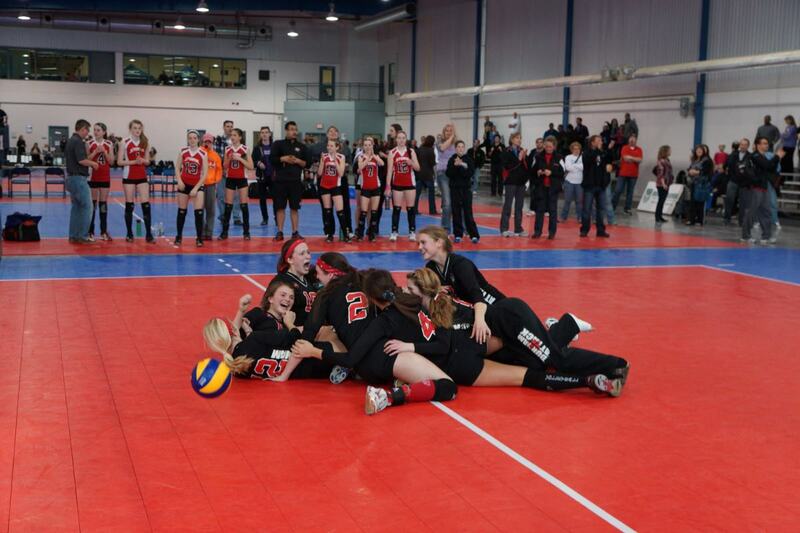 Girls 13U Smash Has a Proud Showing at 14U OVA Provincials! 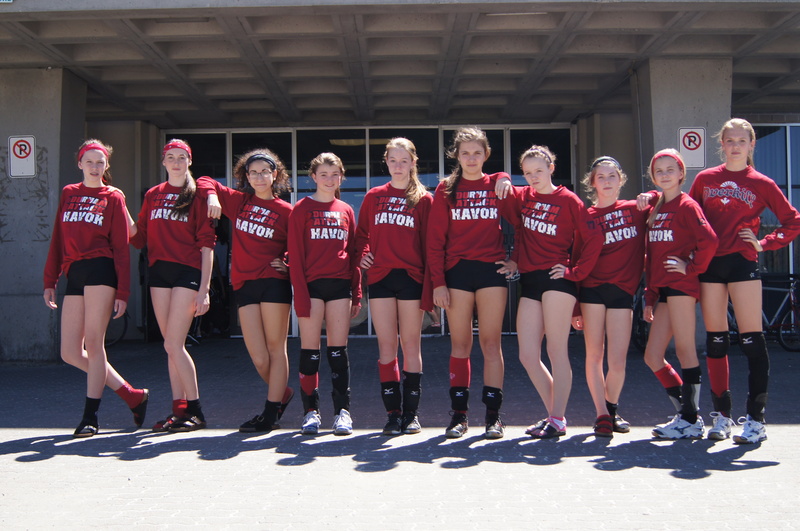 In most of the team’s first experience at Provincials, 13U Smash played up in 14U Girls in Waterloo April 19th-21st, positioned strongly in Division 1 Tier 1. The team had a great start to the tournament with a commanding victory in their first game against South County Bandits (25-13, 25-14), but then took two close losses against Barrie Elites 14U Black (24-26, 12-25) and Georgian Cubs (23-25, 23-25). Saturday morning was a strong start again, pulling out a win against Pegasus U14 Partay Blockers (25-23, 5-25, 15-9), but then the day brought two more tough defeats against Forest City 14U Blue (25-13, 13-25, 11-15), and Etobicoke Titans 14U Prometheus (15-25, 18-25). The girls ended the day with a super fun night of team spirit, going bowling (with Coaches “Twinkle Toes” Joel and “Fancy Shoes” Kristy), putting on a fun talent show for the parents, and pitting sets of twins against each other in the “Twin Game”. They started the day on Sunday refreshed and with renewed determination to show the power of their awesome team spirit, and fought a breathtakingly close battle against Scorpions 14U from Cambridge, taking the first match (25-23), losing the second (22-25), hoping to get the win in the third, but couldn’t quite make it happen, narrowly losing 11-15. The team was disappointed to head home, but ended the tournament in a respectable 9th place in Division 1 Tier 2, tied with 7 other teams, and proud that no other 13U team finished higher in the 14U Provincials. A weekend to feel great about all around, with some terrific playing experience and team spirit building to set the stage for the next weekend’s 13U Provincials! Go Smash!! April 21, 2013 — Oshawa, ON: Players from the Durham Attack Volleyball Club have been crowned the province’s Queens of the Court. 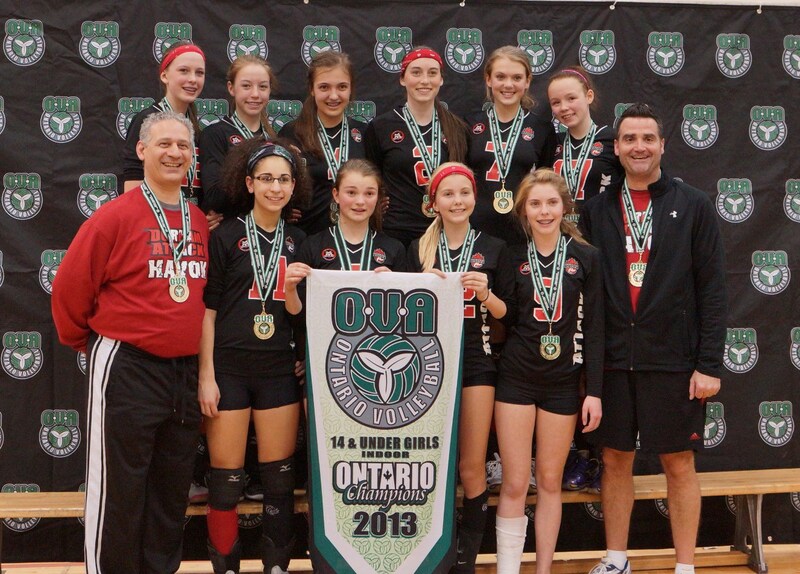 The club’s 14U Havok team returned from the Ontario Provincial Championships in Waterloo this past weekend with a Division 1-Tier 1 gold medal, earning them Ontario’s top 14U girls’ volleyball team title. Ranked third out of 98 teams, Attack Havok went into this elite championship with just one goal in mind – to bring the gold home to Durham. 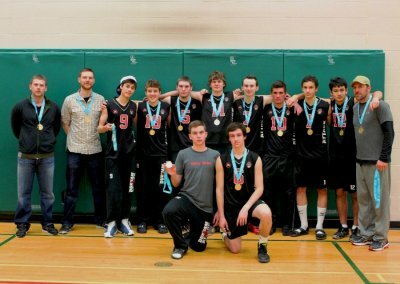 Coming off the heels of an impressive ninth place finish out of 88 teams in the Ontario 15U Championships the weekend before, Attack Havok were ready to finish their own 14U provincial season with some hardware. On their first day of pool play the girls found themselves allowing some games to go to a third set but still managed to prevail in the end going undefeated on day one. Day two’s power pools played out much like the first with the girls remaining undefeated but knowing if they were to make it to the gold medal on their third and final day, they would need to dig a little deeper. Plagued by various injuries and illnesses throughout the weekend this team needed to focus their energy on playing smart and staying healthy. Day three was a win or go home scenario and Havok players were not ready to pack their bags. Their first win of the day came in two straight sets against a familiar Scarborough Titans. Before they could get into the quarter finals, Havok would need to make it through a very strong, and consistent, Etobicoke Titans. While it was a point-by-point game all the way, Havok once again prevailed in two sets. This win secured a spot in the playoffs for Havok who were now poised to face a tall and very powerful Kitchener-Waterloo Predators; a team that had already eliminated some very promising teams from this competition. A win against the Predators would send Havok to the finals while a loss would mean they would need to settle for a bronze medal battle. Havok was not prepared to settle. When Havok hit the floor in this semi-final match they didn’t hold back. They aptly defeated the Predators in two sets and managed to continue this momentum to the gold medal match where they met with the top-ranked, and also undefeated, Ms Pakmen from Mississauga. At the 15U Championships the weekend before, Havok and Ms Pakmen came head-to-head with Havok coming out on top and Havok needed to do the same this weekend. The first set had both sides battling back and forth but Havok narrowly took it by just two points. In the second set Havok unleashed some amazing offence that allowed them to secure the gold medal win and the provincial title. Congratulations players and coaches on an amazing accomplishment. Havok players are: Ashley Forgie, Bianca Cirone, Carleigh Semeniuk, Kaitlyn Hancock, Kelly Schaefer, Kendal Whyte, Maddy Jenkins, Megan Murphy, Soleil Puusa, and Taylor Butcher. Coaches are Chris Dunn and Mike Cirone. Watch the gold medal video and awards. 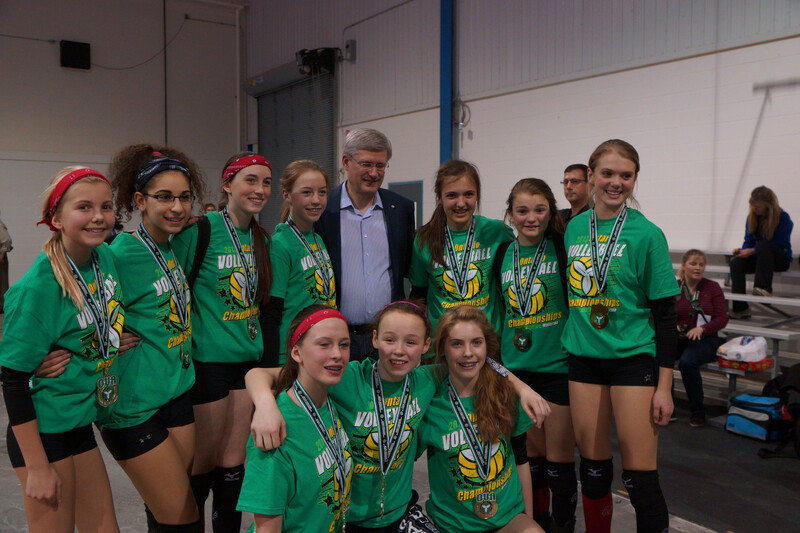 Yes Mr. Harper, you may have a photo op (hee hee). 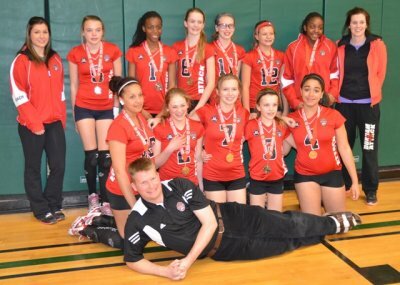 Durham Attack Havok have earned 4 gold and 1 silver medal in 14U competitions this season. They will be travelling to Sherbrooke, Québec in early May to participate in the Canadian National Championships. 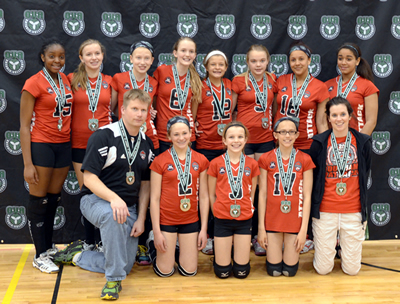 13U Girls Smash on a Silver Streak! April 12, 2013. 13U Girls Smash on a Silver Streak! Way to “Shine” your way to the end of the tournament season, 13U Girls Smash! In their last 3 tournaments of the regular season, 13U Girls Smash “shone” with 3 consecutive Silver medal performances, in the 13U McGregor Cup in Cobourg on March 2nd, the 14U Hawkins Cup in Peterborough on March 23, and the 13U Bugarski Cup in King City on April 6, 2013. 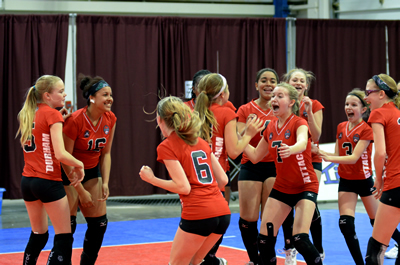 In all three tournaments, the Gold was at their fingertips, but the team was edged out of the win in nail-biting, point-by-point battles ALL 3 times in a row by the team which has become their toughest rival and nemesis this season – STVC 13U Tektonics. Smash finishes their first regular Competitive season together with an impressive collection of 2 Gold medals (one in 14U which earned them a spot in the Championship East division of the 14U McGregor cup in Newmarket on Feb 16th, where they came a respectable 7th – even without their head coach! ), and 3 Silver medals – impressively finishing the tournament season ranked 28th out of 98 teams in14U, and 7th out of 52 teams in 13U! Every single player has become stronger over the season and has made a solid contribution to the team’s excellent performance. It is a joy to see how much they all love the game and enjoy playing together as a team no matter what the combination of players on a line at any time! All they need to do is find their groove, be consistent and “play like they can” and they will be fierce competition for anyone. Here we come Provincials!